Being sick is bad enough, but the social stigma that goes along with looking like a runny-nosed zombie certainly doesn’t help things. Humans are generally repulsed by the visible symptoms in sick peers, overlooking other signs of illness like body odor. For a scent-oriented mouse though, the smell of a sick cage-mate is a bit more obvious, and would seemingly be a way for healthy individuals to avoid unnecessary exposure to contagion. However, studies have found that healthy neighbors of sick mice strangely start smelling sick themselves, although at this point its unclear how or why this helps either mouse. The first step in testing all this was to expose healthy mice to infected neighbors. Some mice were allowed to have direct contact with their suffering peers, while others were separated by plastic barriers in their cages. None of the healthy mice were ever infected themselves, but their urine and body odor seemed to tell a different story. While the change in smell was nothing a human nose could detect, trained ‘sniffer’ mice and gas chromatography could detect a new, sickly scent. 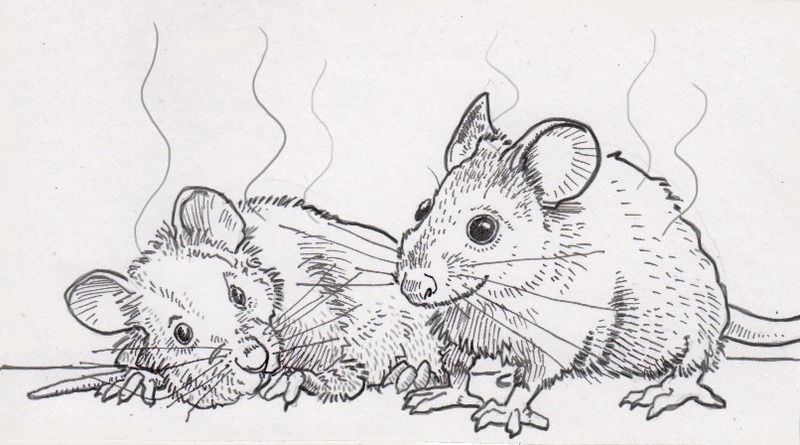 The ‘sniffer’ mice were trained to move towards the smell of a sick mouse in a Y-shaped maze. When asked to sniff out unwell odors, urine samples from healthy mice smelled sickly around 63 percent of the time. Once it was established that mice could indeed detect the change in the odor of their healthy peers, researchers set out to identify exactly which chemical components were responsible. The three main components of a sick scent were all products of pheromones. This was unexpected, as these chemicals were normally associated with male mice looking to assert dominance or attract a mate. It’s then unclear why those pheromones would be tied to smelling like you’re sick. Actually, considering how most sick animals are avoided by their peers to avoid the transmission of pathogens, researchers aren’t sure if there’s any evolutionary advantage to imitating the scent of illness in the first place. One possibility is that there is no significant benefit to smelling like you’re sick. It’s possible that the healthy mice exposed to sick cage-mates experienced an immune response to prepare them for possible infections. That physiological activity may be creating the pheromone by-products, and that the smell is simply sort of an inconsequential side effect. While evolution generally pushes organisms to be successful or efficient in their environments, smelling sick may be harmless enough that there was no pressure on mice to avoid it.